I feel like I’ve barely looked at a book this month, though actually the list below isn’t especially short. I have watched a lot of films, including Logan, which isn’t my favourite X-Men film (that would be Days of Future Past), but is my favourite standalone Wolverine film. My favourite film of the month was probably Freeheld, the 2015 film based on the true story of a dying policewoman fighting to have her pension assigned to her domestic partner. It made me cry a lot, but also includes a very funny turn from Steve Carrell as a gay rights activist who takes on the case. On 10 March, for British Science Week, I ran a 10k virtual race. I was so proud of myself! Now I have to make sure I keep the effort up ahead of the Bristol 10k at the start of May, which I’m running for charity (more on that soon). Now I need to wrench myself away from all the films we have on DVD, Netflix and Amazon Prime and get some reading done! Despite losing an hour, we packed in a lot of fun this weekend. Yesterday we took the steam train and ferry from Paignton to Dartmouth with some friends. The weather was perfect, with blue skies and some real warmth from the sun for one of the first times this year. We ate local crab sandwiches, took a cruise around the estuary and (after some searching) found a place for cream tea with delicious scones and terrible wait staff. 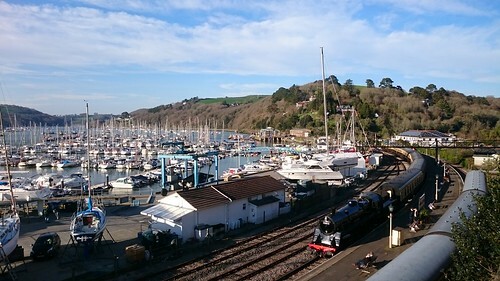 We weren’t in Devon for a literary break, but it so happens that one of the stops on the steam train line is Greenway Halt, which exists solely for visitors to Greenway, the estate of one Agatha Christie. I haven’t read her books since I was a teenager but back then I was a big fan. I couldn’t resist picking up one of her titles in the railway shop. Maybe I’ll rekindle my fandom and next time we’re in Devon I can drag Tim round another author’s home! I remember spotting this book in the Serpent’s Tail catalogue last year and immediately liking the sound of it. It had potential to be brilliant or awful, to deal with complex matters sensitively or insensitively. Thankfully, to my mind, Rabinyan got it just right. Liat is a translation student spending the academic year in New York City. She is practical and idealistic. Hilmi is a painter struggling for his artistic break. He is passionate and pessimistic. When they meet one day in a coffee shop there is instant attraction, but it also immediately clear that theirs won’t be a straightforward courtship. Besides the fact that Liat has only six months left on her visa, there’s the question of where she will be moving back to. Because she is from Israel and he is from Palestine. The narrative isn’t quite linear, dealing with different aspects of the relationship in turn. First there’s getting to know each other. Then there’s Hilmi’s burgeoning art career. Then how they act around their friends. And so on. The day of Liat’s departure keeps getting close, only for the story to jump back a few months to fill in fresh detail. It feels very much like the way someone remembering events might structure their thoughts. Sue Townsend was reliably both funny and socially relevant, and she doesn’t disappoint here. The title doesn’t refer to the Midlands town’s destruction in World War Two – it is, rather, about a woman called Coventry. Coventry Dakin introduces herself with two facts: she’s beautiful and she killed a man. Specifically, her neighbour Gerald Fox. And now she’s on the run in London, without her handbag. Killing Gerald was a spur of the moment decision, hence Coventry’s less-than-perfect running-away outfit. We learn the story behind the murder and the fallout for Coventry’s husband and children, interspersed between Coventry’s survival on the streets of the capital. This being a comedy, there is an element of the ridiculous to much of the action. The murder weapon is an Action Man doll. She had been in the middle of cleaning her chimney, so she’s wearing old clothes and covered in soot. Her husband Derek is really only interested in his tortoises. This is an unusual book, primarily because of its historical setting and premise. While there are plenty of historical novels, there are few that remain so determinedly non-specific about the time and place in which they are set and even fewer where the action revolves around the forced enclosure of common land. England (which is presumably the setting, though even that isn’t stated outright) had a series of Enclosure Acts from the 12th century to the 19th, but they became especially common in the 17th and 18th centuries. Effectively, this allowed landowners to seize common land – land that their tenants, which often meant whole villages, farmed for their own use – and enclose it, controlling what was farmed there. This might mean charging rent to local people or it might mean switching to a type of farming that employed far fewer people, such as sheep farming. It doesn’t sound like the most auspicious basis for a book, but actually that part of it really worked for me. It felt very relevant to be reading about social injustice, the rich getting richer while the poor lose what little they have. There is some action too – arson, violence, death – which the landowner turns to his advantage, though the villagers don’t realise it.